Innocent XIII, born Michele Angelo Conti, Roman Catholic Pope from 1721 to 1724, was the son of the Duke of Poli, and a member of a family that had produced several popes, among them Pope Innocent III, was born in Rome on the 13th of May 1655, served as nuncio in Switzerland, and, for a much longer time, in Portugal, was made cardinal and bishop of Osimo and Viterbo by Clement XI, whom he succeeded on the 8th of May 1721. One of his first acts was to invest the emperor Charles VI with Naples (1722); but against the imperial investiture of Don Carlos with Parma and Piacenza he protested, albeit in vain. He recognized the Old Pretender, "James III" and promised him subsidies conditional upon the re-establishment of Roman Catholicism in England. Moved by deep-seated distrust of the Jesuits and by their continued practice of "Accommodation", despite express papal prohibition, Innocent forbade the Order to receive new members in China, and was said to have meditated its suppression. This encouraged the French Jansenist bishops to press for the revocation of the bull Unigenitus; but the pope commanded its unreserved acceptance. He weakly yielded to pressure and bestowed the cardinal's hat upon the corrupt and debauched Dubois. 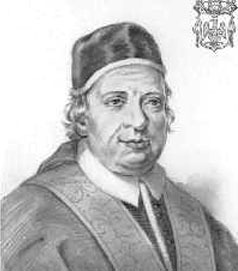 Innocent died on the 7th of March 1724, and was succeeded by Pope Benedict XIII.